The 5K Finish Training Program is designed for the beginner runner and walk/runner, or for those who would like to return to running. During this 10 week program, participants are surrounded by a team of dedicated, motivated people all working toward the goal of becoming healthy and strong. By the time participants cross the finish line of their goal 5K (3.1 mile) race, they will have learned the importance of proper form, stretching, injury prevention, hydration, and nutrition - all the tools needed to maintain their new fitness routine. Our 10-week 5K Finish spring training program is scheduled to begin on Tuesday, February 5, at 6:30 PM from the store. Twice-weekly coached group sessions are held every Tuesday at 6:30 PM and Saturday at 8:00 AM from the store. The final group run will be Tuesday, April 9. To learn more about the training program, please join us at the store on Thursday, January 31 at 7:15 pm for an informational meeting. 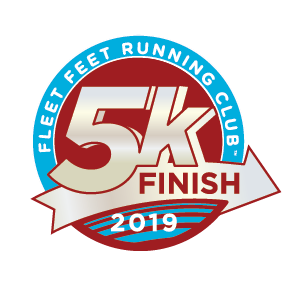 Save the date: Our 10-week 5K Finish fall training program starts in August 2019. We will train for The Purdue Boilermaker 5K on October 19, 2019.